This is a cheap ship. Undergunned compared to the CR90 that came before it, and not much more durable. Hell, even if it is more durable is an open ended question. The ship initially looks very similar to the CR90, with a Command value of 1, a Squadron value of 1, and an Engineering value of 2. It'll respond quickly, probably won't be making any unassisted squadron commands, and engineering is also something unlikely to be revealed. For defenses, it comes with 5 Hull and 2 shields fore, but only a single shield to the sides and aft. It has a slightly better suite of defense tokens, trading the CR90's dual Evade tokens for a single Evade and a Contain, plus the single Redirect. So less evasive at long ranges, but better able to take a hit to the hull without suffering critical damage. The Contain also allows it to take Damage Control Officer to avoid potentially devastating criticals like Assault Proton Torpedoes or MS-1 Ion Cannons on a Task Force Organa title'd ship. Speaking of upgrades, both variants of the ship can take the various titles, an officer, an offensive retrofit, and a weapons team. This marks the cheapest place the Rebels can bring a Weapons Team into the fight, quite a discount over the Assault Frigate MkII. For speed, the ship can only make Speed 3, and is most maneuverable at lower speeds, though one might argue that I-I-0 at Speed 3 is better than the 0-I-II of the CR90 for making tight turns and inside turns. At Speed 2 it becomes quite maneuverable, with yaw values of II-I, capable of a 90' turn with the help of a Navigation Dial. At speed 1, it retains full maneuverability, getting II. For upgrade differences, it equips Turbolaser upgrade cards. Arguably the more exciting of the two, for giving the Rebels something that they haven't had before. The Hammerhead Torpedo clocks in at a paltry 36 points, 3 points cheaper than the cheapest Rebel combat ship to date. It also is now the cheapest platform for ordnance upgrades of either side. Boasting a rainbow of colors out of the front arc, it also had a single Black out of the sides and nothing from the rear. It also boasts a single Black die for anti-squadron attacks. Which commanders make the Hammerhead shine? Dodonna does like critical damage, and while they do have Garel's Honor and ordnance slots, I don't think he offers much more than just being the cheapest. Garm doesn't like Command value 1 ships, so look elsewhere for him. Mon Mothma though gets some use out of the Evade, especially on a ship that wants to close in to engage with the Torpedo variant. For wave 2 commanders, you can just discount Ackbar outright. A single die that isn't even long range isn't enough to consider them for his lists unless as a cheap CR90 replacement, or roleplayer. Rieekan can get a lot of use though out of an even cheaper blocker than a CR90B. Wave 3/4 brings Cracken and Madine; Cracken lets the ships close and make their pass better at Speed 3, while Madine gives that same Speed 3 a much better yaw than before. Both will work fairly well. Sato can get some use out of the Torpedo Hammerheads, letting you use them with actual critical ordnance, which normally they don't have enough dice to really guarantee the critical result. He can also get some use out of Scouts, as they have cheaper Red dice to switch to Black at long range than the CR90As. 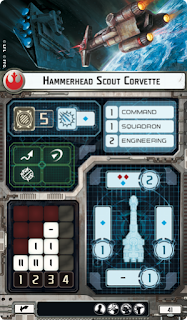 Finally, Leia can do some interesting things with the Hammerhead, bringing their potential squadron pushing to 3 (with Expanded Hangers), giving them extra dice and rerolls, letting them make the Speed 1 to Speed 3 (or vice versa) jumps, and letting them repair hull. Garel's Honor - 4 points - When you overlap an enemy ship, the enemy ship suffers a faceup damage card instead of a facedown damage card. I kind of like this card in a Rieekan fleet similar to my old CR90B blocker fleet. Garel's Honor crashes in, eats a face full of Star Destroyer, blows up, shoots at the Star Destroyer, and rams it again. It might even be able to beat 44 points of CR90B doing 3 hull damage (from crashes) and 6 points from 2 SW7 shots with concentrate fire, at 43 points by doing 2 face up hull, 1 face down hull, and 6.5 average damage from External Launchers with concentrate fire. Task Force Antilles - 3 points - When you suffer damage from an attack, you may choose and exhaust a copy of this card on another friendly ship at distance 1-3. If you do, that ship suffers 1 of your damage instead. While this card is exhausted, you cannot spend engineering points. The first question that needs asked is "Can you use this multiple times in a single attack?" FFG's preview says you can, but it also said that you could use two evades against a single attack, so... The rules are somewhat ambiguous as well. Because you take damage one at a time, is each point of damage suffered an individual opportunity to activate this ability? Or is the damage step itself the singular opportunity? Probably the latter, but you could argue the former. Until this is resolved in a FAQ, check with your tournament's Judge before using this card, or default to the strict ruling. Assuming the later, this card is best used to protect your Task Force against enemy Bombers. If they only do a single point of damage, you can spread the love between your ships and basically ignore the bomber swarm with your Hammerhead fleet. It gets even more fun if you can add Shields to Maximum! to the mix somehow. Again, assuming you can only use it once per damage step, this won't do a lot to protect you from the full brunt of a Star Destroyer's forward battery, but every little bit helps on a ship with no Brace. Task Force Organa - 1 point - When attacking you may choose and exhaust a copy of this card on another friendly ship at distance 1-3 to reroll up to 2 attack dice. While this card is exhausted you cannot attack ships. An important thing to keep in mind on TF:O is that you can't attack SHIPS. Anti-squadron batteries still function as normal. Other than that, this is the cheapest way in the game to get you a ton of Red dice rerolls. Or even Black rerolls if you are feeling frisky and don't want to shell out 4 points for Ordnance Experts. Even if you are doing something silly like firing 6 dice from the front, 2 rerolls is usually all you need anyway. Officers for such an inexpensive and not particularly robust ship should be cheap. Consider Damage Control Officer to improve your Contain tokens, or Lando as emergency defenses if you decide you really need to crash into the front of that ISD. Veteran Captains or Hondo can ensure that you have the squadron command to fire off your boarding party. And Chart Officer lets you be sneaky on the approach, as though it was Jaina's Light all along. Flight Controllers are an interesting option, assuming you take Expanded Hangers and have some way of getting the effects of the Squadron token (Leia or Raymus). It's the cheapest way to boost 3 fighters. 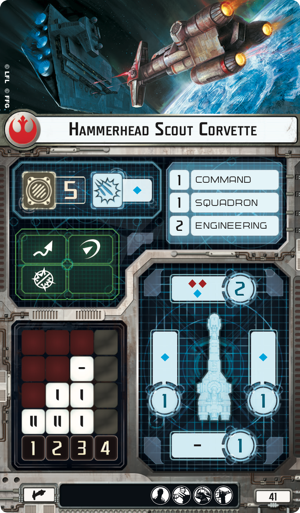 More arguably useful though would be Ordnance Experts on Torpedo Hammerheads, or Veteran Gunners on Scout Hammerheads, for crucial dice rerolls. Either one could make do with a Ruthless Strategist, for Flak duties. This is a new trick for Wave 6, and the Hammerhead has an easier time with some than others. Boarding Troopers isn't particularly effective, as it only affects a single defense token with the Hammerhead's Squadron value of 1. To borrow a phrase, Boarding Engineers seems like a "win more" card. If you've already put a lot of damage on a target, Boarding Engineers will help you cripple it, but it won't help you get that hull damage onto the target in the first place. It does work as an anti-Reinforced Blast Doors card though, letting you flip damage up that Reinforced Blast Doors would otherwise heal. Interestingly, you get to look at all the damage cards, and flip up the ones you want, so in the end it doesn't matter that you only have 2 engineering because if the card you want is in the damage pile, you'll flip it face up with your first pull. Cham Syndulla definitely doesn't care what ship he's on. He only cares what ship he is going to ruin the day of. Being able to flip every single dial is a very powerful tool, as anyone who has been Slicer Tooled and hand to suffer a single turn for it can tell you. 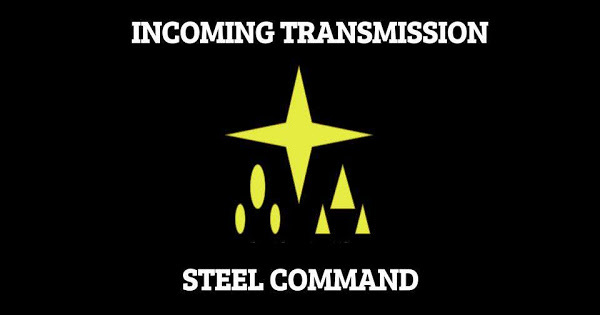 He may be scary enough that we see Specific Order officers or Liaisons show back up in fleets. Unless you are going for some kind of gimmick, or using the slot for Boarding Parties, this isn't likely to be needed. Expanded Hangers or Quad Laser Turrets are viable with the right gimmicky build. External Racks for anti-ship. Flechettes for anti-fighters. Pick one or the other for your Torpedo Hammerhead, then pick some way to give yourself some rerolls. Interestingly, Spinal Armament gives you the ability to shoot out of your rear arc. Aside from being interesting, that isn't a very good idea. Turbolaser Reroute Circuits is an option, but expensive and you only have 1 Evade to work with. For more viable options, Slaved Turrets give you 3 Reds out of the front, and you likely aren't taking multiple shots with a Hammerhead anyway. The recently spoiled Quad Battery Turrets let you creep into the fight and toss an extra Blue at long range instead... but it is far from guaranteed. The final option is Dual Turbolaser Turret, giving you that bonus Red die rolled, and for a point cheaper than Slaved Turrets. Lower ceiling, similar average. Torpedo Boats: Damn the torpedoes, full speed ahead! Crash right into the enemy and unload everything. Long Range Firepower: Pump out as many Red dice as you can. Point arc forward for maximum firepower! Cham Assault Craft: Gettin' the original General Syndulla into the fight! Cheap Blocker: Use with Rieekan for maximum effectiveness.